CHURCH bells rang out across Downpatrick to mark the end of the Great War. It was just after noon on the 11th day of the 11th month of 1918 when the telegram reached the county town declaring that, after four blood-soaked years, the most disastrous war in history was finally over. The Down Recorder was published on a Saturday at that time and it provides a full record of how the news of the first Armistice Day was celebrated in the towns and villages of Co Down. Unlike the sombre memorial event that Armistice Day has become each November, the first day of peace in 1918 was a day of undiluted joy and celebration. 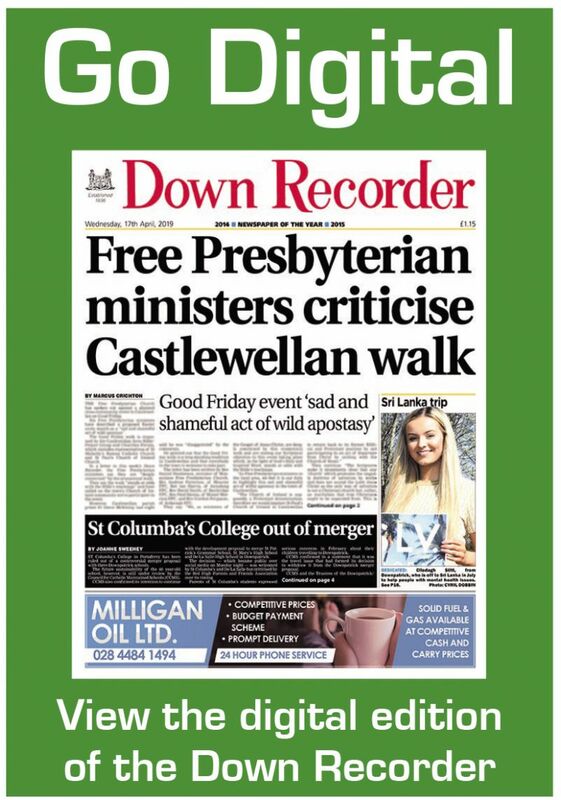 The Recorder reports that when the telegram reached Downpatrick on Monday, November 11 the bells of Down Cathedral and Down Parish Church were rung to let townspeople know the good news. The town was then “beflagged”. That night the Craig Conservative flute band and the Hibernian flute band paraded the streets of the town, reflecting the sacrifices of both sides of the community in Downpatrick — the original Ulster Volunteers with the 36th Ulster Division and the Irish Volunteers in the 16th Irish Division. “Nobody was jollier than the soldiers on leave from Ballykinlar,’’ the newspaper reported. Ballynahinch flute band and other flute bands with pipers and big drummers paraded the streets, followed by a cheering crowd. In Killyleagh, they had two bonfires to celebrate what the Daily Express described as “the greatest day in history”. Bonfires were lit at the Castle and at the Cross with Killyleagh described as being “in jubilation’’ over the cessation of hostilities. The bell of St John’s Parish Church rang out across the town as soon as word reached Killyleagh of how momentous a day it was. The following night the windows of “almost every house were illuminated”. It is recorded that speeches were delivered by among others Col Gawn Rowan-Hamilton, of Killyleagh Castle, and by Mr W C Carr, of the Gocean. As townspeople took to the streets, they carried Killyleagh-born Thomas Matthews shoulder high through its streets. He had won the Military Medal the previous year at Cambrai when, while serving with the 16th Royal Irish Rifles (Co Down Pioneers) and under heavy German shell fire, he had carried three wounded men to safety. Across Strangford Lough, in Portaferry, the announcement of peace was celebrated by the unionist band parading the streets. An effigy of the former Kaiser was burned in the Square. Saturday night. When the armistice was eventually signed on Monday, the celebrations were stepped up in the town. “Flags were displayed from private houses and churches, an immense bonfire was kindled in the Square while a life-size effigy of the ex-Kaiser was played around the town by bands from Saintfield, Carrickmannon and Cahard and was eventually consigned to the flames amid the cheers and jeers of the assembled crowds,’’ the Recorder reported. “Dancing and singing were indulged in around the fire till a late hour and it is due to the crowd to say that perfect good humour prevailed. The Recorder’s correspondent reported of the hopes that an ending of petrol restrictions would lead to a resumption of motoring and the public would be able to buy white bread again with the German submarine menace finally ended. As the peace treaty was signed, the volunteer soldiers from Downpatrick, Ballynahinch, Killyleagh and Newcastle who made up the remnants of `C company’ of the original 13th Royal Irish Rifles (the Co Down Volunteers), from the 36th Ulster Division — slaughtered on the first day of the Somme — were resting out of the front line. The statistics are shocking... an estimated 59 million soldiers had been mobilised on all sides and more than eight million were now dead, with over 29 million injured. It was a war that changed the world. And everyone would remember where they were when war finally turned to peace on November 11, 1918.